The wimpy comet Elenin, which vaulted into the public spotlight as a so-called harbinger of doom, has met its own demise, and its remains won't be back for 12,000 years, NASA scientists say. The comet made a swing through the inner solar system in recent months, coming closest to Earth on Oct. 16, but by that time all that was left were crumbs. The fate of comet Elenin, it seems, was sealed in September during its closest approach to the sun. "Elenin did as new comets passing close by the sun do about two percent of the time: It broke apart," said Don Yeomans of NASA's Near-Earth Object Program Office at NASA's Jet Propulsion Laboratory in Pasadena, Calif., in a statement Monday (Oct. 25). "Elenin's remnants will also act as other broken-up comets act. They will trail along in a debris cloud that will follow a well-understood path out of the inner solar system. After that, we won't see the scraps of comet Elenin around these parts for almost 12 millennia." Yeomans called Elenin an "ex-comet," one that should soon be forgotten. "Comet Elenin is still dead," JPL officials wrote in a Twitter post. Two telescopes operated by astronomers at the Marshall Space Flight Center just stopped scanning the skies for Comet Elenin, which began fading and breaking apart back in August. Now only empty space marks its close approach (22 million miles) to Earth. However, a meteor and the barred spiral galaxy NGC-2903 grace the top of this October 14, 2011, image. "Comets are made up of ice, rock, dust and organic compounds and can be several miles in diameter, but they are fragile and loosely held together like dust balls," Yeomans said. "So it doesn't take much to get a comet to disintegrate, and with comets, once they break up, there is no hope of reconciliation." The object became an Internet sensation when doomsayersproclaimed that comet Elenin would bring disaster to Earth. Some scenarios claimed comet Elenin would trigger catastrophic earthquakes due to its gravitational interactions with Earth. Another claim speculated that Elenin wasn't a comet at all, but actually a rogue planet called Nibiru that would also wreak havoc on Earth. A NASA photo taken of where Elenin should have been on Oct. 14, just days before it reached its nearest point to Earth, revealed nothing but a stray meteor and a distant spiral galaxy. "The meteor and the galaxy were purely coincidental, as it is what is not visible in the image that is important," NASA meteor expert Bill Cooke wrote in a blog post. "Two telescopes operated by astronomers at the Marshall Space Flight Center just stopped scanning the skies for Comet Elenin, which began fading and breaking apart back in August." 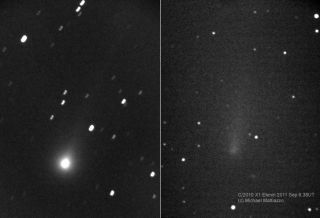 Comet Elenin was discovered in December by astronomer Leonid Elenin of Lyubertsy, Russia, who used a remotely operated observatory in the United States to make the find. The comet, also known as C/2010 X1, was about 1.2 miles (2 km) wide when it was still in one piece. Despite the hype, all of the outlandish comet Elenin doomsday claims were completely unfounded, NASA said repeatedly. But then NASA's official responses to quell the wild speculation were taken as attempts to hide the truth about comet Elenin, the space agency said. "I cannot begin to guess why this little comet became such a big Internet sensation," Yeomans said. "The scientific reality is this modest-sized icy dirtball's influence upon our planet is so incredibly miniscule that my subcompact automobile exerts a greater gravitational influence on Earth than the comet ever would." Still, Yeomans expects some die-hard conspiracy theorists will maintain that comet Elenin still exists. "Perhaps a little homage to a classic Monty Python dead parrot sketch is in order," Yeomans said. "Comet Elenin has rung down the curtain and joined the choir invisible. This is an ex-comet."